Habitat: Cultivated in the lowlands up to 1300 m above sea level., In humid areas and ample water. Description of the plant: Herbaceous annuals, not trunked. Single leaf hugging bulbs. Thickened and fleshy bulbs, red vaginal discharge. Hump​​-shaped inflorescence, ovoid-shaped petals. Round stone fruit, green. Seeds black triangle. 125 ml water, Onion bulbs 4 g; Leaf poko ( Mentha arvensis ) 4 g; Sembung ( Blumea Balsamifera ) 3 g; Gotu kola ( Centella asiatica ) leaves 4 g; 2 g fennel fruit; contused, made ​​pills or boiled, Taken 1 time a day, 100 ml of the morning, drink 1 a day crushed 1/4 cup, pill, taken 3 times a day 9 pill. Fruit beans (chopped) 15 g; Bulbs of red onion (chopped) 4 g; Bay leaves (chopped) 120 ml, Boiled, Drink 1 a day 100 ml. 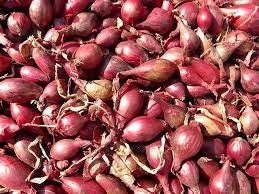 Bulbs of red onion (cut into thin strips) to taste; Coconut oil to taste; Eucalyptus oil to taste, knead, oil is applied to the abdomen is bloated, the whole body, legs, and hands on the child's fever.